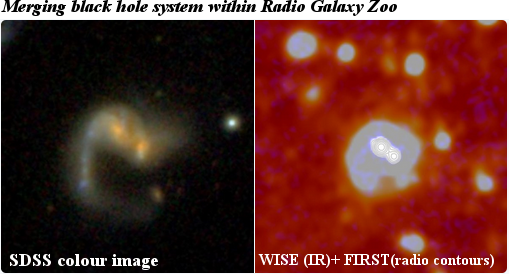 First Radio Galaxy Zoo paper has been submitted! The project description and early science paper (results from Year 1) for the Radio Galaxy Zoo project has been submitted! We find that the RGZ citizen scientists are as effective as the science experts at identifying the radio sources and their host galaxies. Based upon our results from 1 year of operation, we find the RGZ host galaxies reside in 3 primary loci of mid-infrared colour space. The mid-infrared colour space is defined by the WISE filter bands: W1, W2 and W3, corresponding to 3.4, 4.6 and 12 microns; respectively. Approximately 10% of the RGZ sample reside in the mid-IR colour space dominated by elliptical galaxies, which have older stellar populations and are less dusty, hence resulting in bluer (W2-W3) colours. 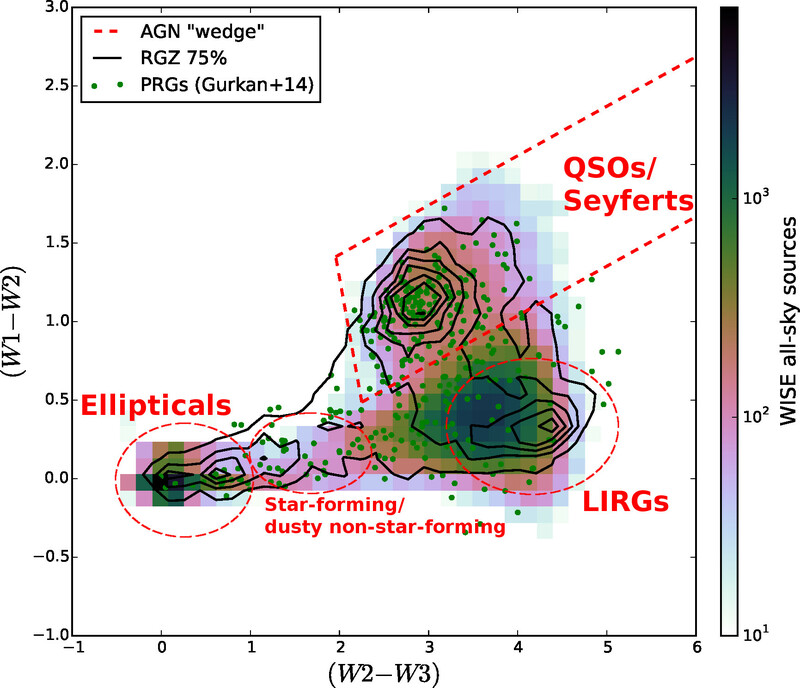 The 2nd locus (where ~15% of RGZ sources are found) lies in the colour space known as the `AGN wedge’, typically associated with X-ray-bright QSOs and Seyferts. And lastly, the largest concentration of RGZ host galaxies (~30%) can be found in the 3rd locus usually associated with luminous infrared galaxies (LIRGs). It should be noted that only a small fraction of LIRGs are associated with late-stage mergers. 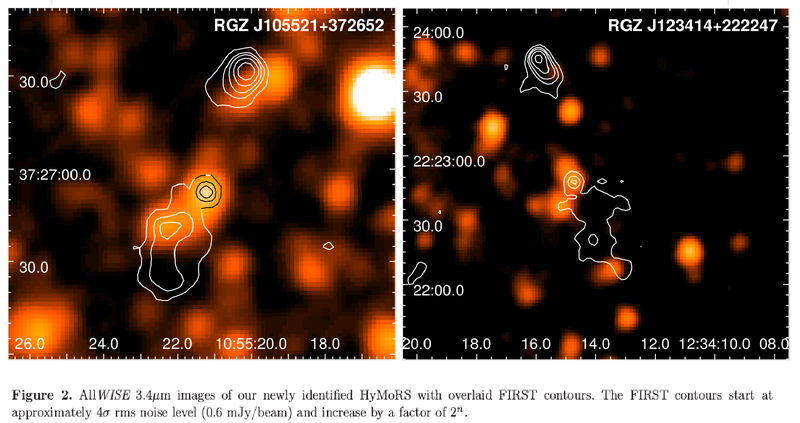 The remainder of the RGZ host population are distributed along the loci of both star-forming and active galaxies, indicative of radio emission from star-forming galaxies and/or dusty elliptical (non-star-forming) galaxies. See the figure below for a plot of these results. Caption to figure: WISE colour-colour diagram, showing sources from the WISE all-sky catalog (colourmap), 33,127 sources from the 75% RGZ catalog (black contours), and powerful radio galaxies (green points) from (Gürkan et al. 2014). The wedge used to identify IR colours of X-ray-bright AGN from Lacy et al. (2004) & Mateos et al. (2012) is overplotted (red dashes). Only 10% of the WISE all-sky sources have colours in the X-ray bright AGN wedge; this is contrasted with 40% of RGZ and 49% of the Gürkan et al. (2014) radio galaxies. The remaining RGZ sources have WISE colours consistent with distinct populations of elliptical galaxies and LIRGs, with smaller numbers of spiral galaxies and starbursts. In addition, we will also be submitting our paper on Hybrid Morphology Radio Sources (HyMoRS) in the next few days so stay tuned! As always, thank you all very much for all your help and support and keep up the awesome work! 1 million classifications and beyond! Huzzah! We have now broken through the 1 million mark with Radio Galaxy Zoo as of January 16, 2015. It has taken all of you ~13 months to do 40 years worth of cross-identifications. Well done and a huge thank you to every single one of you out there who helped us along. A big shout-out to the winners of our 1 millionth classification milestone competition. The winners are: @planetari7, @ChrisMolloy, @leonie van vliet, @antikodon, @BOSSARD louis michel and @JF45456. I will be e-mailing each of you soon. My biggest thank you to every single Radio Galaxy Zooite who helped us get this far. We really could not have done this without you. Happy 1st birthday Radio Galaxy Zoo! Hurray! Radio Galaxy Zoo has reached its first anniversary! 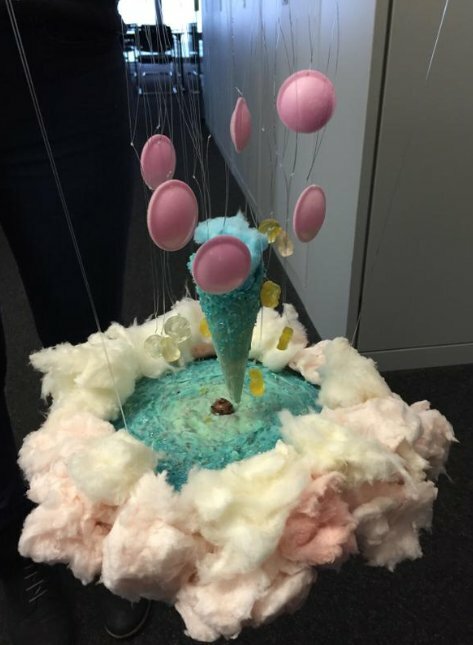 A scrumptious cake model of an AGN made by Zookeeper Kevin’s students, Anna Weigel & Lia Sartori. What a wonderful year it has been! In 1 year, we have completed ~30% of the project and have reached nearly 1 million classifications! In celebration of our anniversary, we are announcing that we will offer some special prizes to the first few citizen scientist(s) who take us to the 1 millionth classification and beyond! The top prizes we have to offer include a signed copy of “Bang! — the complete history of the Universe” signed by Brian May & Chris Lintott, a black ICRAR T-shirt (in your size), a CSIRO water bottle, CSIRO mugs, 3D telescope bookmarks and some Zooniverse stickers. 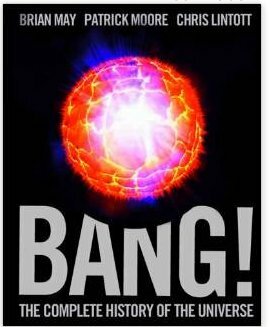 First prize for the RGZooite who helps us reach 1 million classification gets a signed copy of “Bang!” ! Using the current number of classifications of 931,029 and assuming that each classification took 5 minutes, this translates to a continuous working time of nearly 9 years! If we assume that one can only classify continuously over a standard 40-hour work-week, it’d take more than 37 years to complete what you all have so kindly done in 1 year! In addition to matching the radio jets with their black holes, we (the citizen scientists & the science team) are making new discoveries of extreme types of radio galaxies. Just a few days after launch last year, @Dolorous_Edd and @antikodon discovered a very large nearby wide-angle tailed radio galaxy. They are currently working with Prof Rudnick and Prof Andernach on publishing their findings and analysis. Large teams of RGZ citizen scientists are also helping Dr Kapinska and Dr Mao with their search for Hybrids and S-DRAGNs, respectively! Thank you all so very much for your support! We are most grateful for such a humbling effort by everyone. We hope that all of you have a wonderful holiday period and wishing you all a great upcoming year! Meet Minnie Mao, leading the study of spiral double radio lobe AGNs (or S-DRAGNs) for Radio Galaxy Zoo. Hello! 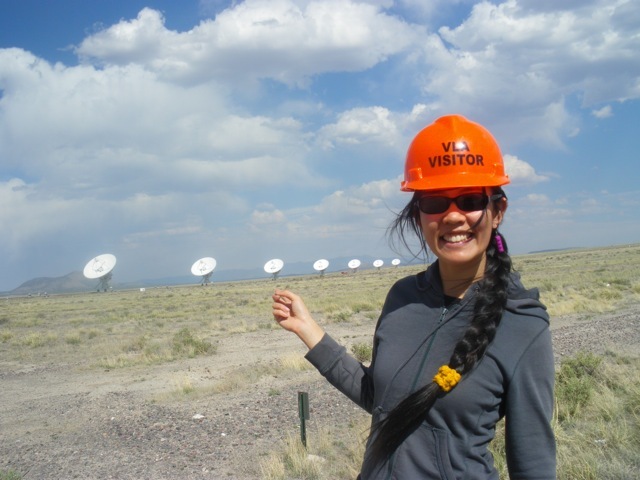 My name is Minnie and I am a VLA postdoc at NRAO in Socorro, NM. Astronomers use a lot of acronyms, and often are not very creative with telescope names/ VLA stands for ‘Very Large Array’, which is where some of the Radio Galaxy Zoo radio images come from! I did my PhD at the University of Tasmania with Ray Norris (yup, THE Ray Norris), Jim Lovell, and Rob Sharp. 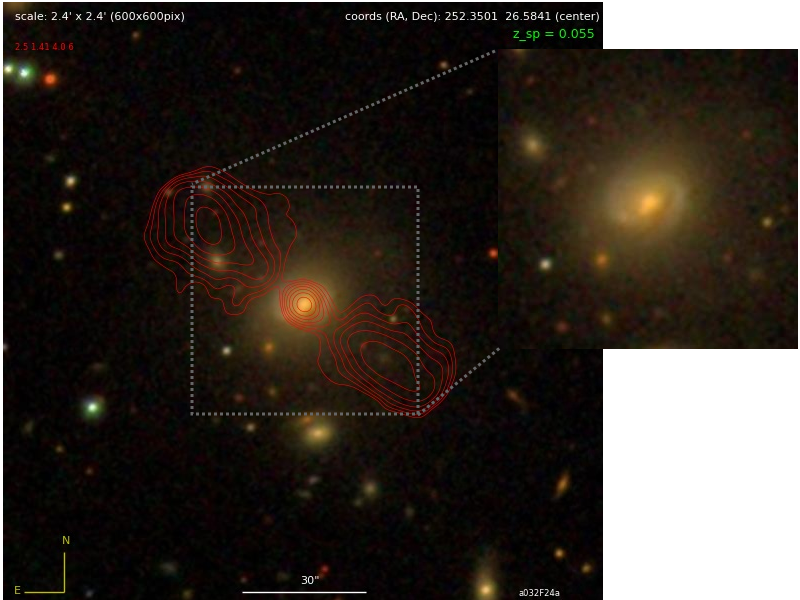 We used optical data cross-matched with radio data from the ATCA (Australia Telescope Compact Array, where the rest of the RGZ radio images come from) to determine how galaxies have changed across cosmic time. A large chunk of the PhD was spent staring at images of radio galaxies, classifying their morphology, and determining their counterparts in optical/infrared images. While this can be a lot of fun, the Universe is rather large so I am glad I can now share this job with the wonderful zoo-ites! One of my primary reasons for being involved in RGZ is because I am excited for the day when radio images become as familiar to people as optical images. To this end I hope you enjoy RGZ, because really, what is more fun than peering far back into the nether-reaches of the Universe? 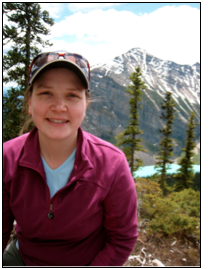 Meet Julie (aka @42jkb on RadioTalk), a project scientist on Radio Galaxy Zoo! I’m a postdoctoral fellow at CSIRO Astronomy and Space Science in Australia. This is my first position after obtaining my PhD from the University of Calgary, Canada working on magnetic fields of radio galaxies. My first memories of astronomy and the wonders of the Universe were spending summer nights outside at campfires with my family staring up and counting the number of “shooting stars” we could see. It wasn’t until my second year of undergraduate studies at Western University in Ontario Canada that I considered doing astrophysical research; I was actually going through to be an airline pilot! I haven’t looked back at my decision to change into physics and astronomy and everyday I am amazed at the complexity and beauty of the Universe. I spend my time researching magnetic fields and how important they are to radio galaxies. You can usually find me at the Australia Telescope Compact Array taking observations of all types of radio galaxies, sitting in front of a computer doing the exact same thing as Radio Galaxy Zoo, learning about life from my daughter, and educating myself on the wonderful country I now live in. I am excited about what Radio Galaxy Zoo has to offer the astronomical community and what the Universe will unfold for us through this project. Thank you for taking part!